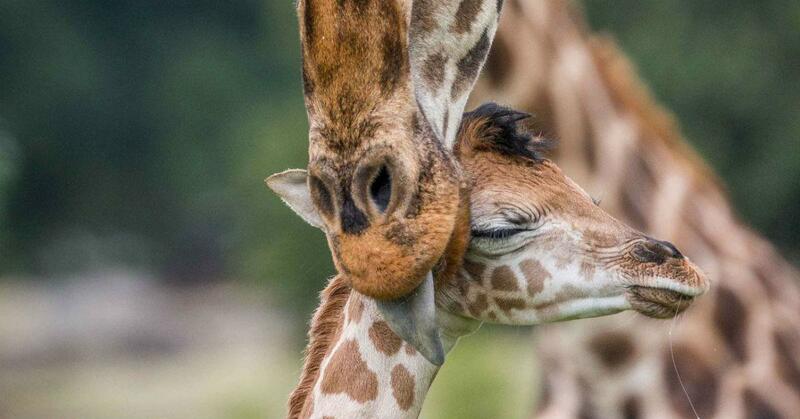 The endangered Rothschild’s giraffe just added a new member to its species. Sandy the baby giraffe calf was born at the Woburn Safari Park in England 10 days ago — and she’s already up and mobile. Footage of Sandy taking her first steps hit the internet almost instantly after her birth. According to Woburn Safari Park, Sandy was “up, suckling, and walking around within an hour,” which is apparently common for newborn giraffes. Sandy’s parents are 20-year-old Savannah and 15-year-old Casper, two of the park’s adult Rothschild’s giraffes. This species is considered endangered, with an estimated population of roughly 1,600 Rothschild’s giraffes remaining in the wild. That makes Sandy’s birth an extra joyous occasion. “We are all thrilled with the new arrival and can’t wait to see the calf grow and integrate with the other giraffes,” Tom Robson, the acting deputy head for reserves at Woburn Safari Park, said in a press release. Sandy got her name through a viewer poll from ITV’s This Morning. The British talk show asked its audience to vote for Sahara, Sophie, Sakari, Simba, or Sandy — which ended in a draw, with Sandy and Sahara tied at 24 percent each. This Morning ruled in favor of Sandy after learning that Sandra Bullock was a “great friend of the safari park,” giving the baby giraffe a Hollywood namesake. At 10 days old, Sandy is already 6 feet tall. But she still has some catching up to do, as most adult Rothschild’s giraffes reach about 18 feet. Sandy will live with the rest of her herd on the park’s Giraffe Junction reserve, a 7-acre stretch of land the giraffes share with a Grevy’s Zebra and some Scimitar Horned Oryxes. Like the Rothschild’s giraffe, these animals are also increasingly rare. The Grevy’s Zebra is classified as endangered, while the Scimitar Horned Oryx is extinct in the wild.